There are so many ways for toddlers to exert their independence at home. 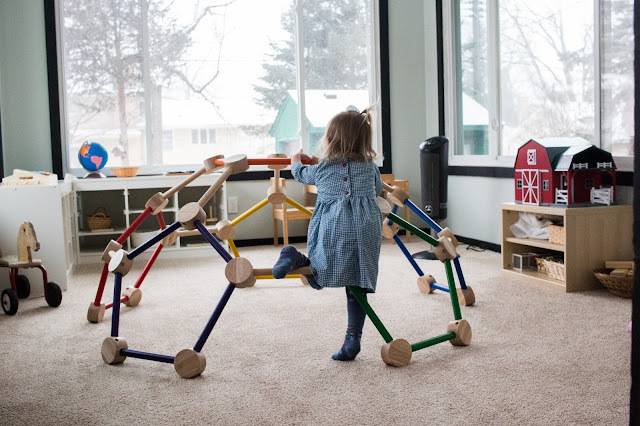 Whether it is through preparing their own meal, or choosing what toy they want to use, Montessori toddlers have the ability to make choices and carry them out on their own. Dressing is no exception to this! Independent dressing is not only an important life skill, but can be a source of pride and creativity for a child. But, without the right help, it can also be a frustrating task. 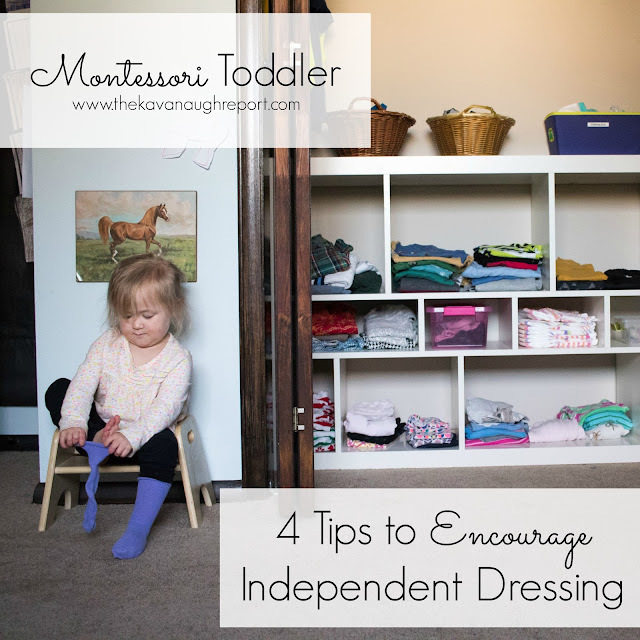 Here are 4 tips to encourage independent dressing at home. 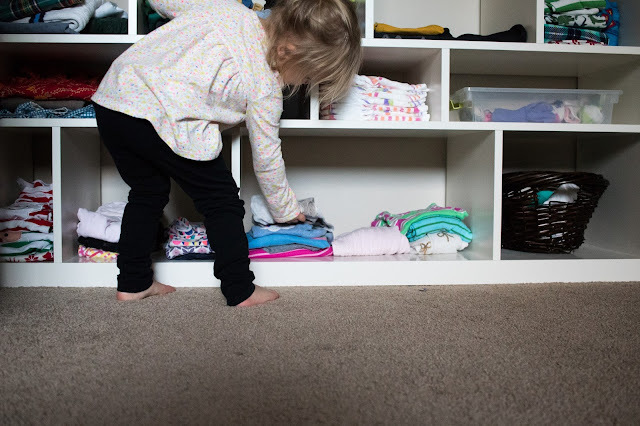 Here are four tips for encouraging independent dressing at home. While there are likely others, these are my must-dos. SEE NORA IN ACTION HERE. 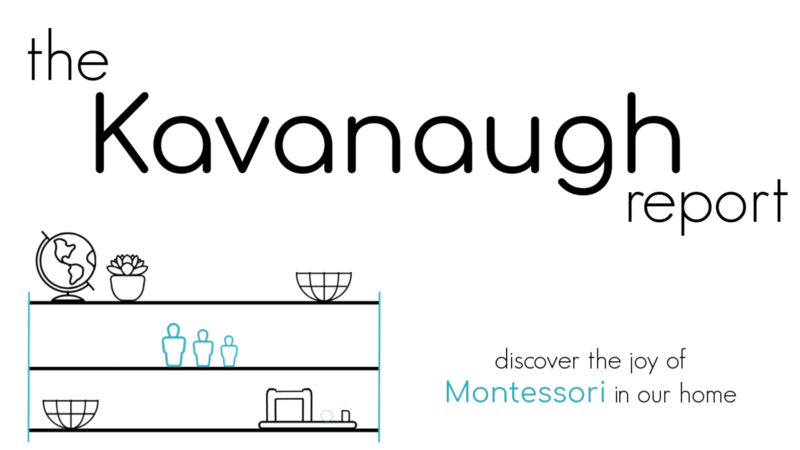 First, like in all Montessori environments, things must be accessible. Toddlers aren't going to be able to learn how to make choices and carry out their decision, if you are always the one driving the dressing. Therefore, choices need to be accessible. 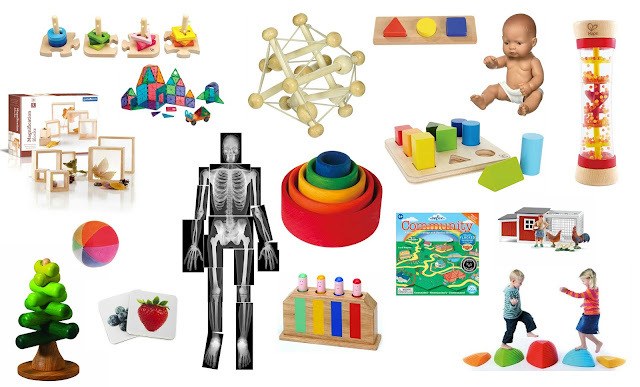 This can look different depending on your space and child's abilities. 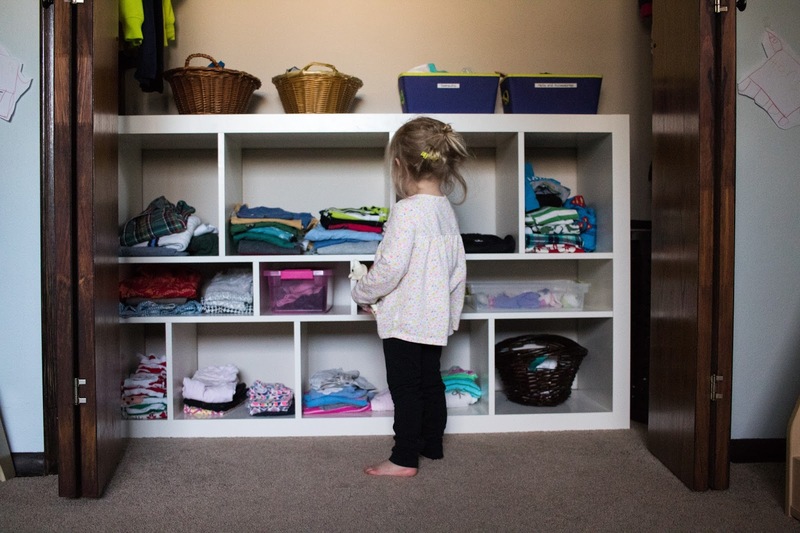 In our situation, my kids share this closet space so open shelving with different levels works nicely. In our old set up, a low hanging bar was the perfect solution. A small wardrobe or dresser may also meet your needs. Just anything that allows your child to access the clothes on his/her own. A low chair is a must for me, but I know that others say can be skipped. 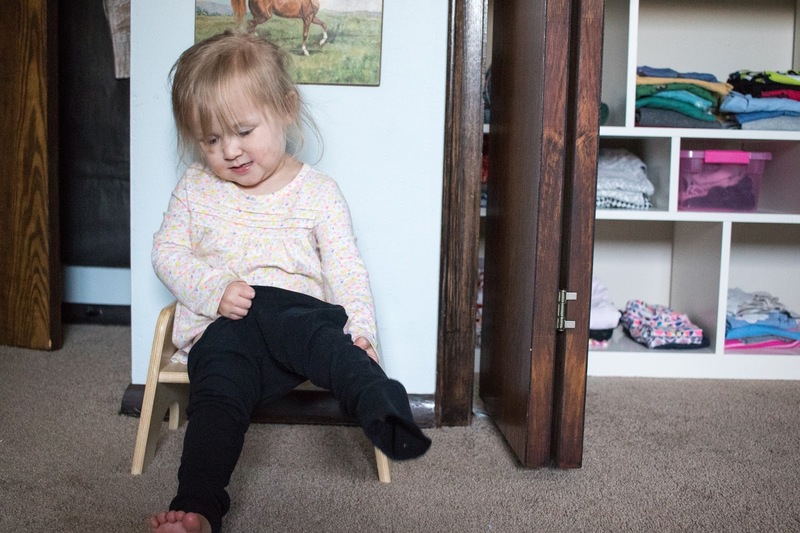 For us, it's been extremely helpful in allowing both Henry and Nora learn to get dressed. 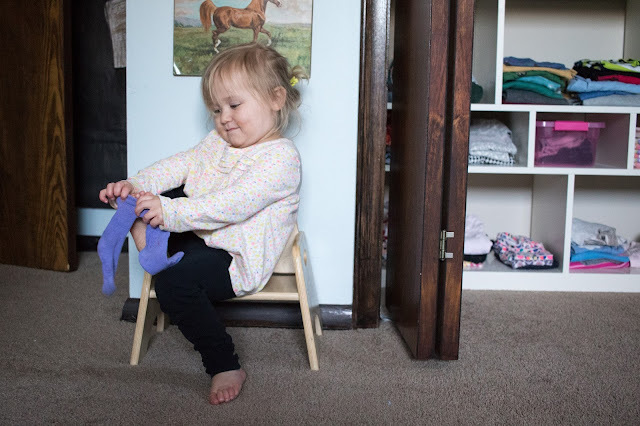 Sitting just that little bit off the floor has really been pivotal in allowing them to learn how to pull clothes on without having to worry about also balancing their bodies. Again, there are many great options available when it comes to little chairs. 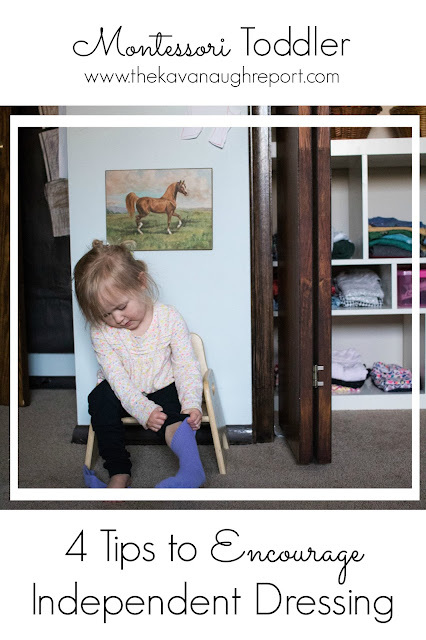 I think the most important thing to consider is whether your child can get in and out of it on their own and whether their feet are close to the ground. My third tip to encourage independent dressing is limiting the choices available to your toddler. While some choice is good, too many choices can be overwhelming. There is a fine line here about what is too many and what is alright. This is one that I personally struggle with for a couple of reasons. One, kids clothes are just so darn cute! I want them all! It can be really hard to resist these cute things when you see them. Two, our weather can be really unpredictable, especially this time of year. One day it's snowing and then two days later it's hot and sunny. So, a wide variety of styles can be necessary just to make sure that my kids will be dressed appropriately for the weather. Finally, I have found that it helps to have a really versatile but coordinating wardrobe. If you are uncomfortable with your child picking an outfit at any given time, don't have that outfit available. Every choice that your toddler makes must be alright for him/her to make. If the choice isn't alright don't have it available. This includes appropriate for the weather and may require more frequent clothes rotations. 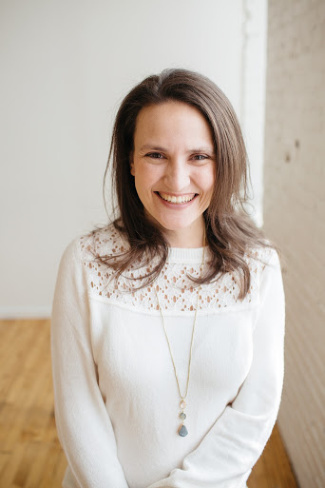 One way that I have found that really has helped me embrace this is trying to purchase outfits with coordination in mind. I know that Nora will get creative with her choices, but I also know that if everything generally goes together, then no matter which direction she goes, she will still mostly look put together. I find Hanna Andersson and Cat and Jack from Target are both wonderful brands to do this with since colors tend to coordinate throughout the season. 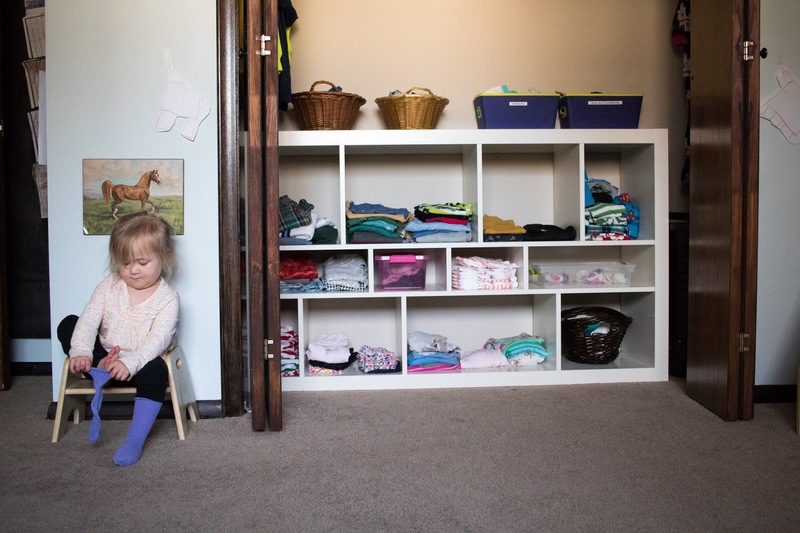 Do your children get dressed on their own? How important have you found environmental changes in helping them succeed? I see Nora putting on her socks! Any tips for teaching a toddler how to do this? I've been working on this for a while with my almost 2-yo, and she really struggles. Maybe it's an age/coordination thing, but I'm also thinking maybe I've got the technique/approach wrong.. Thanks!